Blurb: "I believe that the reader will discover here the essential nature of one of the strangest and most awful chapters in human history," Arthur Miller wrote of his classic play about the witch-hunts and trials in seventeenth-century Salem, Massachusetts. Based on historical people and real events, Miller's drama is a searing portrait of a community engulfed by hysteria. In the rigid theocracy of Salem, rumors that women are practicing witchcraft galvanize the town's most basic fears and suspicions; and when a young girl accuses Elizabeth Proctor of being a witch, self-righteous church leaders and townspeople insist that Elizabeth be brought to trial. The ruthlessness of the prosecutors and the eagerness of neighbor to testify against neighbor brilliantly illuminate the destructive power of socially sanctioned violence. 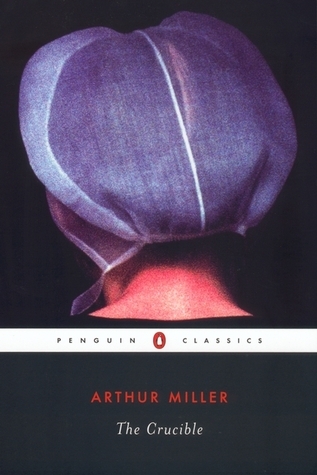 Written in 1953, The Crucible is a mirror Miller uses to reflect the anti-communist hysteria inspired by Senator Joseph McCarthy's "witch-hunts" in the United States. Within the text itself, Miller contemplates the parallels, writing, "Political opposition... is given an inhumane overlay, which then justifies the abrogation of all normally applied customs of civilized behavior. A political policy is equated with moral right, and opposition to it with diabolical malevolence." With an introduction by Christopher Bigsby. Review: I’m going to suggest now that you should go and read Chami’s review of this play here, because it is way funnier than this one is going to be (it also contains mild spoilers). I had legitimately never heard of this book before Chami read it for her Literature class, and then suddenly it was everywhere. Despite this, I managed to avoid it until it came up in my own Literature class. I was studying ‘Who’s Afraid of Virginia Woolf’ by Edward Albee and so for my wider reading of the topic I was pointed in the direction of about ten different playwrights- Arthur Miller just happened to be one of the ones that stuck out for me. Before I actually started reading the play, I knew a little about it from Chami. I knew that it was about ‘witchcraft’ in Salem and I also knew that it was supposed to represent McCarthyism but that was about it- I didn’t know anything about the actual plot or the characters of the play. This was all interesting to me anyway, so I got interested in the actual play pretty much from page one. There was this part of me which was so desperate to find out what happened in the lead up to the play and what was going to happen during the play. I loved how fast-paced everything was- it’s actually one of my favourite things about plays in general, I feel like it wasn’t filled with any unnecessary stuff but rather that it got start to the point and didn’t slow down until the very end. I grew to love and hate each of the characters. I just couldn’t decide how I felt about each of them for sure because they were always changing and developing, which was both awesome and aggravating to read. I say aggravating in the sense that I felt like my emotions were just been thrown around and stomped on by all of the characters at once and I didn’t know who to trust and who not to. In Chami’s review, she says how she likes that none of the characters were really heroes or villains; they were sort of in that grey area. I think this created a lot of depth in the play because as I mentioned above, you weren’t really sure who to side with. I definitely enjoyed this, probably more than I thought I would have- I found it so enjoyable and easy and quick to read.